Have a black thumb with houseplants? Pothos tolerates low light. As the vine lengthens, you can make cuttings and replant them in the same pot—just poke a hole in the soil with a pencil. Or if you lay the stem, still attached, on the soil surface, it will root. Or put stems in a jar of water where they can grow for years without soil. Photo by Barb Gorges. Published Oct. 19, 2014, in the Wyoming Tribune Eagle. Do you have a black thumb when growing houseplants? The cure is as simple as having the right plant in the right place with the right amount of water. Ironically, the best way to check the water needs of plants is by feeling the soil—and probably getting a little black dirt on your fingers. Plants indoors provide several benefits besides accenting your décor. They produce oxygen and add humidity. Some, including the spider plant and pothos, remove toxins from the outgassing of building and furniture materials. Also, scientists tell us gazing at their natural forms does something good for our psyches, especially over a long winter. Often, people complaining about their black thumbs are having a bad experience with a potted plant that came from a florist. It was in full bloom and now it’s dead. The likelihood of a beginning indoor gardener finding success with a hothouse plant is about the same as for someone trying Mount Everest for their first hike. Houseplants are often descendants of tropical plants brought back by Victorian-era explorers in a time when the wealthy could afford glass-walled conservatories. When glass became more affordable, houseplants proliferated. But these plants come from many micro-climates around the world with varying amounts of humidity, rainfall, light and heat. Your best bet is to start with the standards, plants that can tolerate a wide range of conditions. These tend to remain foliage-only plants in the climates provided by our homes and offices. My three favorites, spider plant, jade plant and pothos, which looks like variegated philodendron, are also easy to propagate so you may be able to find a friend who will share cuttings or a starter plant. With jade and pothos, planting a cut stem is as easy as poking a hole with a pencil into a small container of potting soil and inserting the stem. 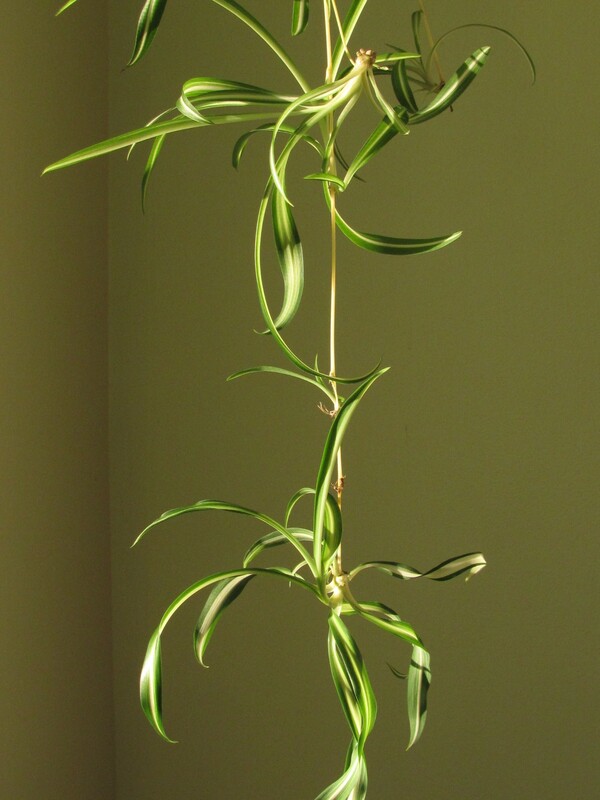 With the spider plant, a “baby” growing on the end of a long stem can be cut off (or left attached), laid on top of the soil and held in place with a paper clip bent in a u-shape. And then keep the soil moist—not wet—until they start showing new growth. 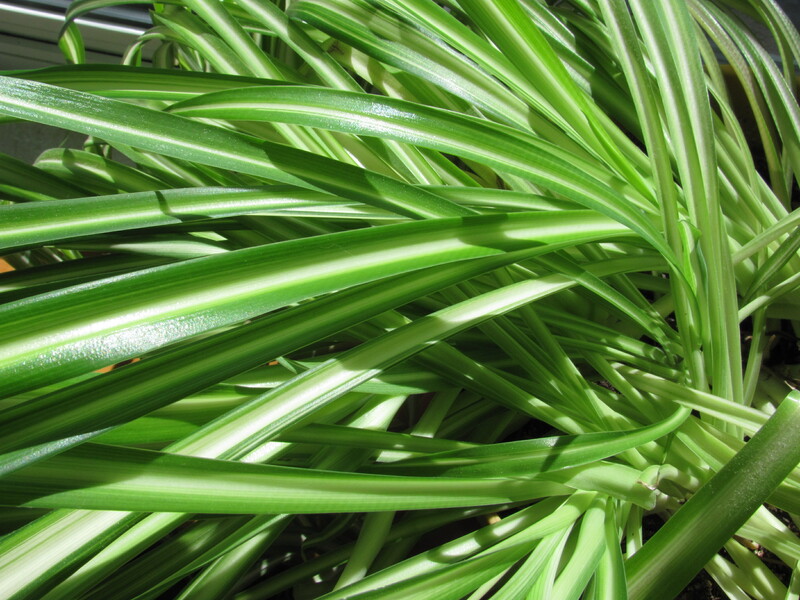 Spider plants prefer bright light, not direct sunlight, but can survive in shade. Most have a white stripe down the center of the leaf; some have a green stripe or a plain green leaf. Older plants produce stems with new plants, “spiders,” and little white flowers. Photo by Barb Gorges. In nature, plants grow where they get what they need. To be a successful indoor gardener, you need to match the plant with the conditions at your house. Many houseplants prefer sunny, south-facing windows. Others are fine with shorter periods of sunlight on the east or west sides of the house. 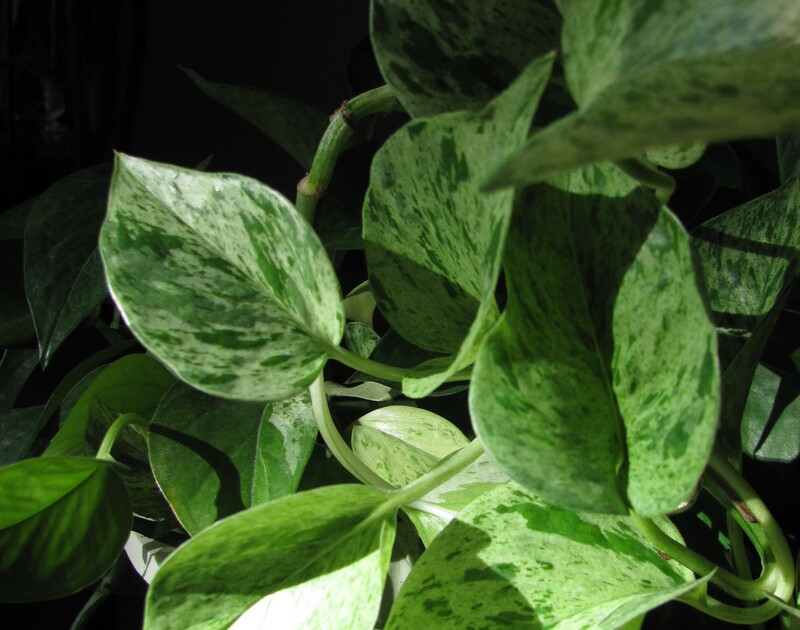 Some plants prefer dimmer light on the north side, or being placed a distance from a window. Only fake plants survive very dim light. And for some varieties, bright overhead fluorescent office lights will be enough. How do you tell how much light your plant will need? Read the label that came with it. Or find out what kind it is by asking a Laramie County Master Gardener, or look it up at the library or online. Experiment with your plants. If they grow long and leggy, or older leaves fall off too soon, they might need more light. Humidity can be important. I had an avocado I grew from the pit that did very well in a bathroom in which two teenagers showered every day. But then we got a new furnace with a stronger blower that dissipated the humidity better and the plant died. Short of growing humidity-loving plants in a terrarium, it helps to group plants together, so they humidify each other. Garden soil—at least our garden soil around here—is a bad choice for indoor plants. General, all-purpose potting soil that can be found at any garden supply center will work for the majority of houseplants. All pots need drainage holes and a saucer that allows you to see when water starts draining out. A pot too big will make your plant look scrawny, besides, many plants prefer cramped roots–it encourages some to bloom. My azalea has been in the same pot 20 years and blooms regularly. 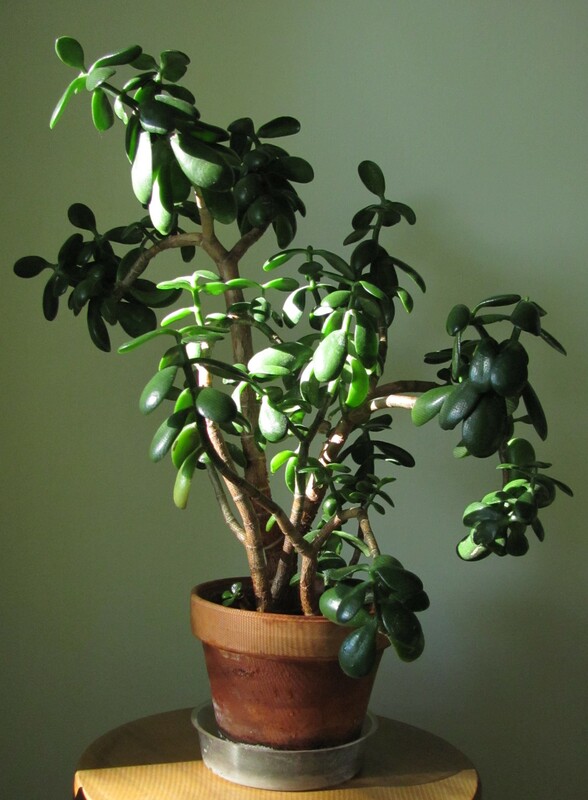 Jade plants are succulents with thick, water-storing leaves. In full sun they grow bushy and may even flower, but even with less than ideal light, they look interesting. Always err on the side of less water rather than more. Photo by Barb Gorges. Don’t kill your houseplant with kindness. Most types will drown, literally, if you keep the soil soaking wet. Roots need air and as soil dries, microscopic air pockets develop. On the other hand, if you let the soil get too dry, especially some of the potting soils with a lot of peat moss, they can become hydrophobic and it’s hard to get them to absorb water again. During the winter, my spider, jade and pothos plants can easily go a week between waterings. But other plants will dry out faster if they have soil that doesn’t hold water well. Same with plants in clay pots, small pots or located near the heating vents. This is where people with black thumbs must get their fingers dirty. The general rule is that the top inch of soil should dry out before watering again. So a few days after watering, stick your finger in the dirt. You can also learn to evaluate the soil’s dryness by the color of the surface, or if you have small plants in light plastic pots, check how heavy they feel. My watering method is to pour enough in to fill the pot nearly to the rim, but no more than the saucer below can hold. Then I wait, water other plants and come back in a couple minutes to see if any water is draining out. I repeat this until I see water in the saucer. If water more water is draining out than what would evaporate in an hour, be sure to dump it or suction it up with a turkey baster so the roots don’t rot. A plant in a livable temperature, receiving the right amount of light and water, is not stressed and is resistant to pests and diseases. Plants look greener if you trim away dead parts. If you occasionally wipe or wash dust off their leaves, they absorb more light and your plants will grow better. Don’t block pores with leaf polishes. Directions for houseplant fertilizer may recommend frequent feedings, but be very cautious, especially in the fall as days get shorter and indoor plants grow more slowly. Wait until early spring to start fertilizing, when plants are really growing again. Even then, don’t be too generous. My three recommendations, spider, jade and pothos, do well enough at my house with hardly any fertilization. Cheyenne tap water seems to be about all they need. “Spiders,” spider plant offshoots, root easily. Photo by Barb Gorges. Categories: Houseplants | Tags: houseplants, jade plant, pothos, spider plant | Permalink.